To promote interior view space or views to the exterior. The benefits of providing this visual access are the ability for focal rest to avoid eyestrain and access to visual information about changing outside conditions. A view amenity also aids varying attention cycles and relieves the stress of mental work. Guidelines apply to all projects designated New Buildings and for Major Renovations. From every continuously occupied position in spaces there must be visual access to an external window view that is at least 10 degrees in horizontal and vertical visual angle at no greater than the 50th percentile standing at an average eye height of 64 inches. From every assigned and continuously occupied workstation position at seated eye height of 48 inches there must be visual access to a view space that is at least 20 feet The view space must be at least a continuous 20 degrees horizontal angle beginning at not more than 10 degrees from the centerline of sight. The view space must also be at least a continuous 15 degrees vertical view angle beginning at not more than 10 degrees from the horizontal centerline of sight and shall be above that horizontal centerline. 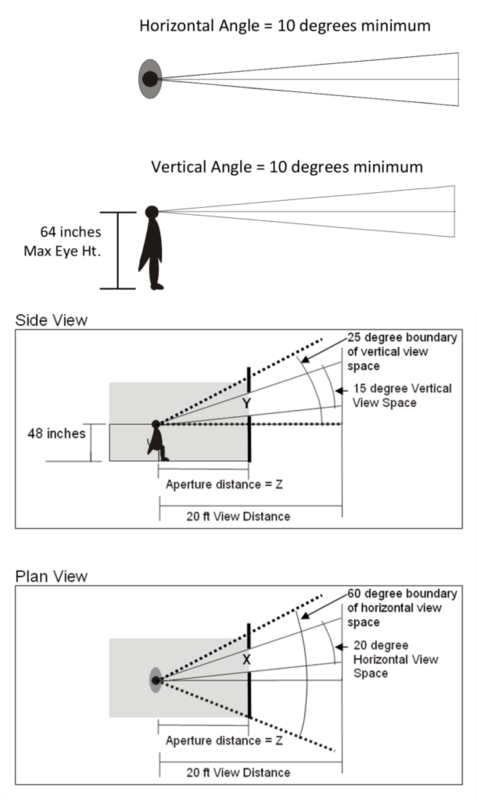 As an alternate to the 20 degree horizontal by 15 degree vertical dimensions of the line of sight, the table Allowable View Space Aperture found under the Meeting the Guidelines section below, which approximates a 20 degree horizontal by 15 degree vertical view angle section below may be used. Higher performance is achievable if views are provided to horizon lines, clouds, tree lines and clusters, and natural waterscapes. Include performance criteria in the programming document. Develop any special view and window requirements during functional programming of activities for the building (e.g., presence of an amenity view space, special security concerns for windows in certain locations of the building). Determine implications of performance criteria for space planning and incorporate into early design. Perform first order estimates of view access given projected uses within building and initial sizing and placement of windows. Identify any problems with window configuration and placement. Confirm compliance with a check of design development drawings. Observe and verify that the room, window, and furnishing variables (upon which estimated compliance was based) are proceeding according to goals as reflected in drawings and specifications through construction documents. During occupancy log comments relating to view space and window access (see P.5 Operations Commissioning for recordkeeping procedures). Verify that performance criteria are met by checking performance onsite. The diagrams and table below may be used to assist in determining vertical and horizontal view space apertures. I.9A: Verification that the design includes visual access to external windows within guideline parameters. I.9B: Verification that the design includes access to view spaces within the guideline parameters. I.9C: Verification that the design includes views as in guideline parameters.